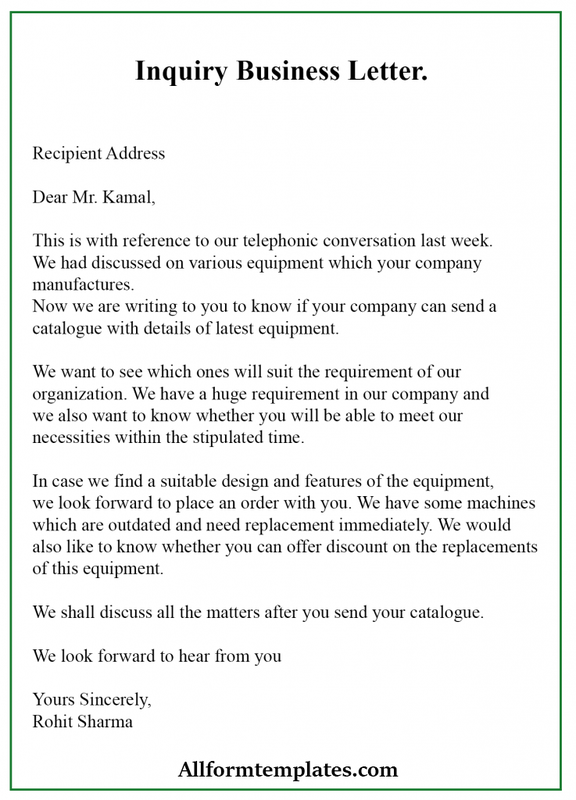 There are many business letters meant for communication, and Inquiry business letter is one of them. It is a communication by one company to another enquiring about their products or services. It can also be written by a customer enquiring about a product that a company is selling. We might think that writing a business letter is difficult and requires a lot of expertise and practice. But if you follow a standard format and follow the conventions, it will be much easier for you to write a business letter. 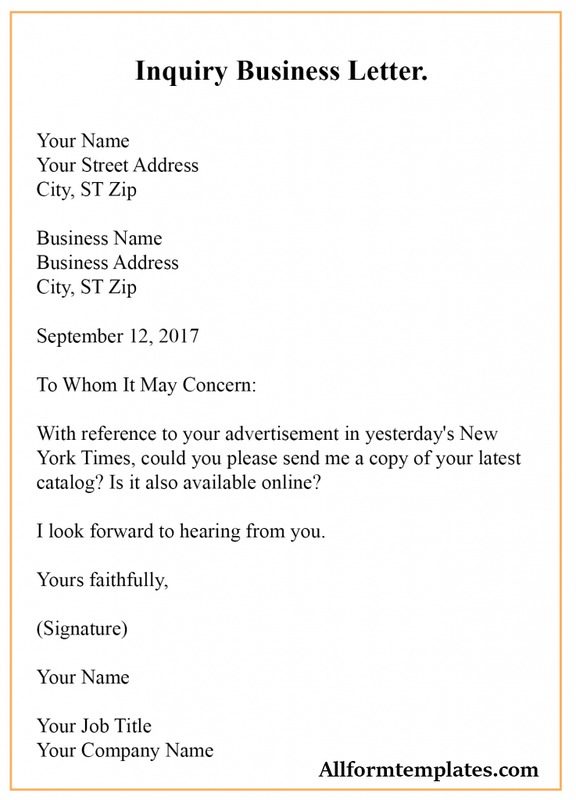 So we have provided you with some tips and tricks regarding how to write business inquiry letters and provided some templates as an example. A business inquiry letter is written by one business to another to obtain information, advice, or specific instructions from another company. It can also be written in case two companies have collaborated for a project, and either of them wants to ask the other information related to terms and conditions and policies relayed to the contract. So here we shall provide you with some examples of business inquiry letter template which you can use from here to create your own business letter. While in the internet age, people prefer emails over conventional letters, still business letters have not lost its importance. Writing formal letters is an art, and care must be taken to follow the standard format while doing so. A business inquiry letter especially should be well-written, in order to keep the relationship with the other party intact and maintain a positive image with the other party. #1. Addressing the Recipient: Make sure to address the recipient correctly. It will ensure that you are dealing with the same person during the entire time of your communication with the other party. Hence this will end any chance of communication or confusion, which can tarnish your image. In case you know the recipient and have communicated with them earlier, you can use a friendly tone in your letter. This means you can even address them using their first names. But in case you don’t know the recipient or haven’t conversed much earlier, you should stick to strictly professional languages. The information regarding an inquiry should never be lengthy and be short and crisp. It should just be related to the inquiry made by the customer and nothing else. You can include all the relevant questions in one letter to save time and efforts. 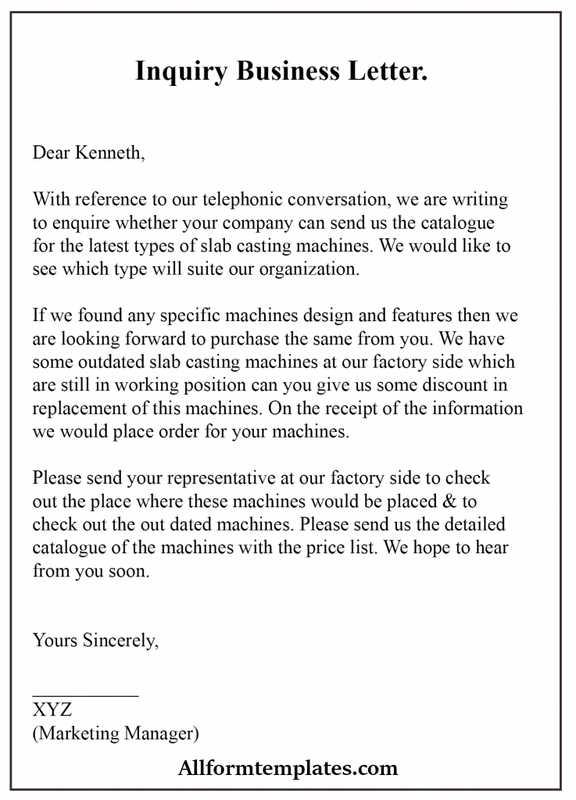 You can include important questions such as price quotations, details regarding delivery, etc. Like all the other formal letters, an inquiry letter must have an introduction, body, and ending. In the beginning, you should start the letter by writing the subject line in it. It should be short, crisp and convey the intention behind writing the letter immediately to the reader. In the introduction, you can start by mentioning the reference through which you are writing the letter, and go straight to asking the main question you want to put up to the recipient of the letter. In the body of the letter, you can ask for solutions to your problem by asking for catalogs, brochures, price quotations, etc. In the closing sentence, you can summarize your letter by adding the phrase “I look forward to hearing from you”. You can then finally close the letter by addressing the recipient as “Your Sincerely” or “Yours Faithfully”.